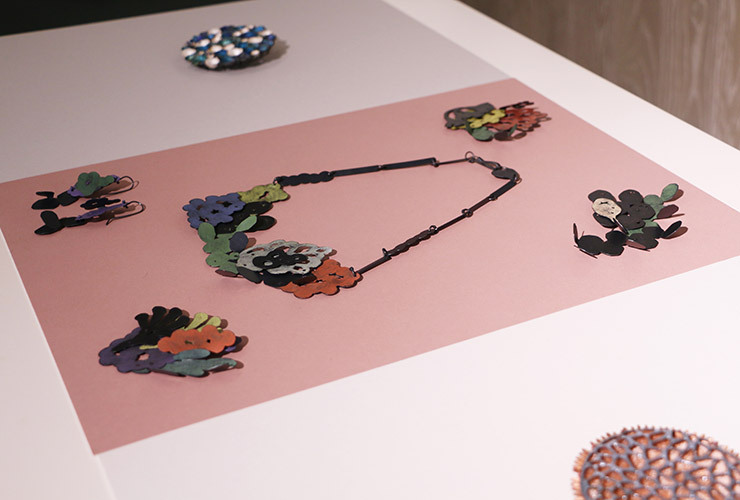 Surrounds is a multi-artist exhibition celebrating contemporary Australian landscapes through innovative jewellery and object design. 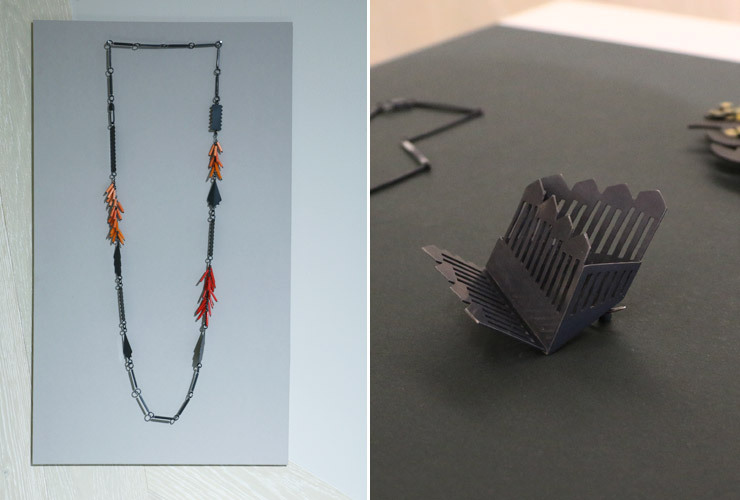 Using jewellery to convey a sense of place and provenance, this exhibition explores our artists’ response to their surroundings. 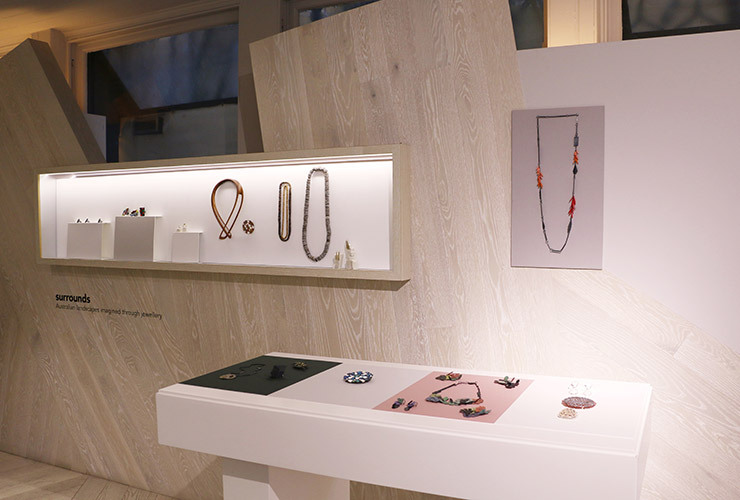 Celebrating unique Australian stones, locally sourced materials and engaging personal stories. The pieces on show during ‘Surrounds’ reflect both natural and urban Australia. Featuring work by Katherine Bowman, Julia deVille, Nina Ellis, Laura Eyles, Yuko Fujita, Nicky Hepburn, Jill Hermans, Sarah Heyward, Maria Natoli, Amy Renshaw and Daniel Serra. Exhibition dates: March 7 – 19, 2016. Opening night Thursday 10 March, 5-7pm. 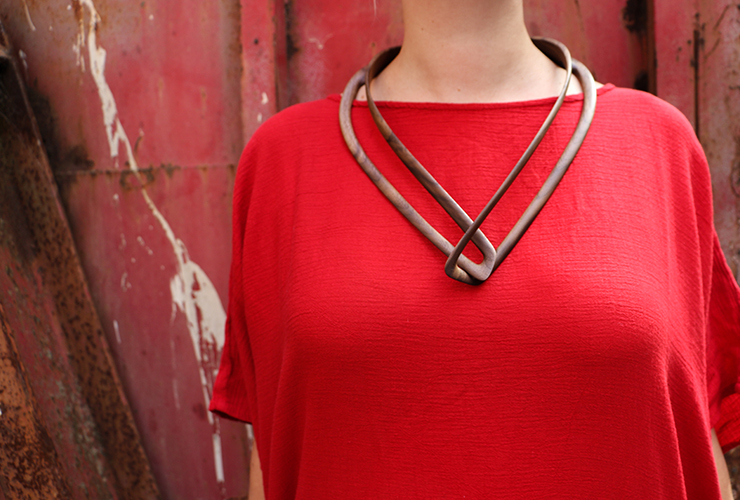 Daniel Serra’s ‘Karli’ neckpiece is hand-carved from Queensland blackwood, echoing the visual form of a boomerang. Eschewing power tools, Serra slows down time with his almost meditative practice, revealing and celebrating the rich and unique texture of the wood. This piece was carved from a single block of wood, and took over 90 hours to create. Sarah Heyward looks up – taking inspiration from Atria, the brightest star in the constellation of Triangulum Australum, only visible from the Southern Hemisphere. Made from a fusion of silver and gold that creates a galaxy-like texture, Sarah’s neckpiece is set with Australian sapphires and opal. Katherine Bowman uses fragments of colour like flickers of memory. 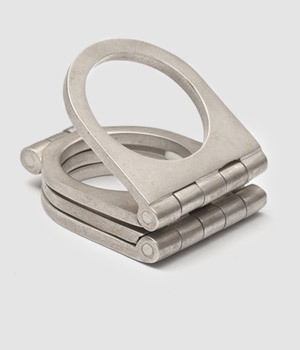 Her large, sculptural rings are engraved and painted by hand. 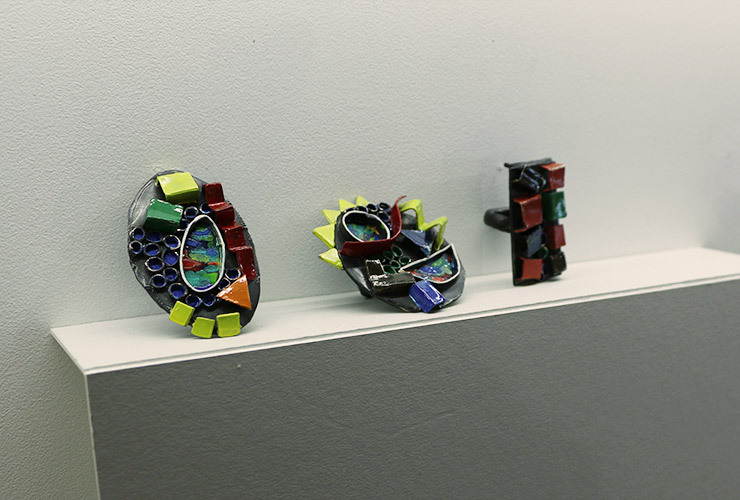 For this exhibition, Katherine has used opal not as a material, but as visual inspiration, translating the stone’s unique beauty into colourful patterns painted on to her rings. 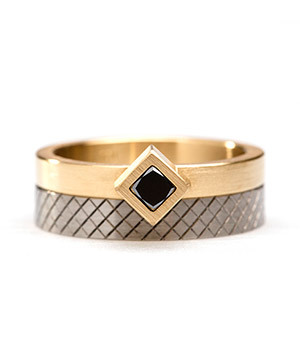 She has also made a set of three oxidised rings called ‘Essence’, set with natural Australian sapphires. 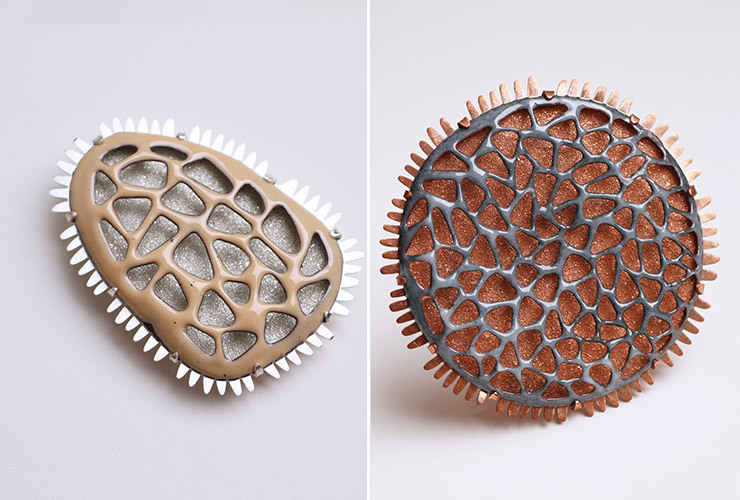 Laura Eyles’ ‘Salt Lake’ earrings and ‘Lake Cowan’ brooch are inspired by the salt lakes near Kalgoorlie. The glass beads used in the pieces are also from Kalgoorlie – this is the substance that is fired into the lines on the road to create reflective surfaces. her ‘Cracked Earth’ brooch represents the fissures and islands created by dry earth as it cracks. 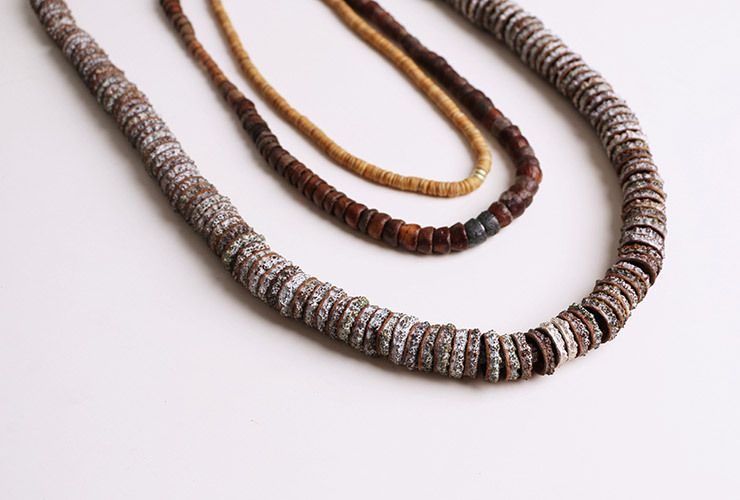 Nicky Hepbur’s necklaces are made of gum tree caps and seed pods collected around coastal Melbourne. The pieces are made from naturally found and collected organic materials, that can never be matched exactly again. 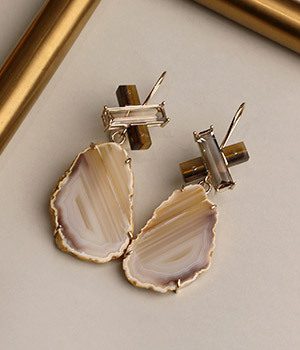 Each necklace features a silver or gold clasp cast to mimic the shape of the natural material. 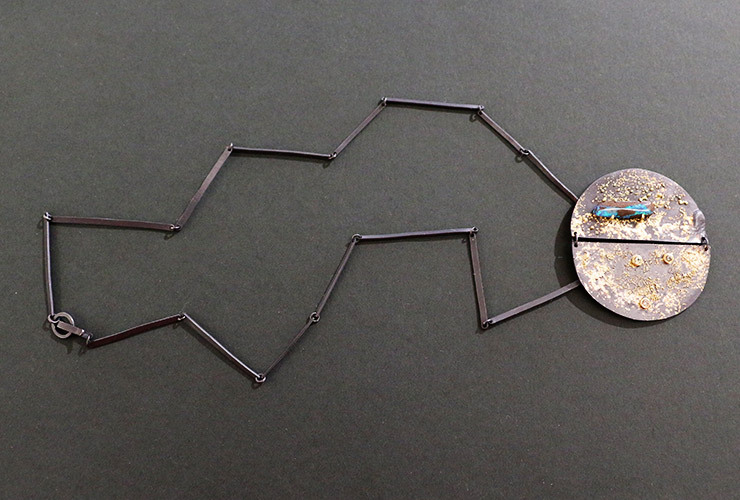 Maria Natoli’s abstract ‘Up on Stilts’ brooch recalls her move from rural to urban environment. With a nod to Queenslander style architecture, layers and angles reference the steep inclines of the city’s streets.